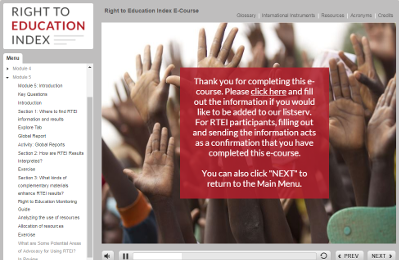 The RTEI E-Course is available on the Resources tab of RTEI.org and linked here. The E-Course is open for public use and completion, but it is specifically designed to support new partners as they navigate RTEI 2018 Questionnaire completion. What is the Right to Education Index? How is RTEI related to the right to education? The anatomy of an RTEI question. How to use RTEI in your education campaign. Each module has information and activities to learn more about RTEI and how to use RTEI in research and advocacy. They also contain activities and questions to practice collecting data for the RTEI Questionnaire and check understanding of new concepts. 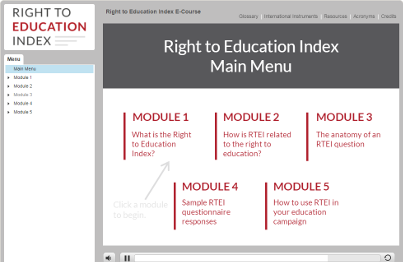 Beginning with a general overview of how to monitor the right to education using indicators, the E-Course describes elements included in the international right to education framework and RTEI. 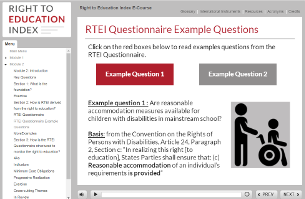 From that foundation, the E-Course focuses specifically on how the RTEI Questionnaire is structured. Built on Tomasevski’s 4-A’s of the right to education (Availability, Accessibility, Acceptability, and Adaptability), RTEI also includes Governance indicators to focus on structural, process, and outcome indicators of right to education satisfaction. 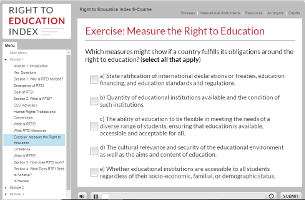 RTEI questions include definitions and their basis in the international right to education framework. The E-Course provides examples of those definitions and where you can find more information in international human rights law. Each question in the RTEI Questionnaire also requires researchers to submit supporting documentation to explain their response. 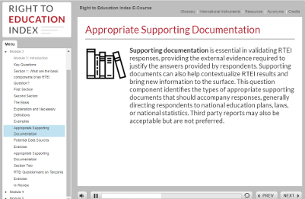 The E-Course provides examples of why supporting documentation is important and what types of supporting documentation are best used to answer questions on RTEI. In addition, the E-Course tests respondents on how best to answer some of the more difficult questions found on the RTEI Questionnaire. 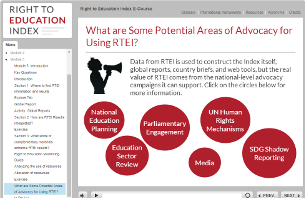 Finally, and significantly, the E-Course describes how civil society organizations might use RTEI data for national advocacy campaigns and suggests ways forward in developing RTEI as a research-to-action tool worldwide. RTEI is a biennial project with one year dedicated to data collection (2016, 2018, etc. ), and one supporting civil society partners to complete nationally relevant advocacy campaigns informed by their findings in RTEI (2017). After completing the RTEI e-Course, be sure to fill out the RTEI E-Course Completion Certificate!